With a breakthrough capacity of 400GB*, you can store even more hours of Full HD video on the card without worrying about running out of room for the videos, photos, music, movies and other files you want to shoot, save and share. 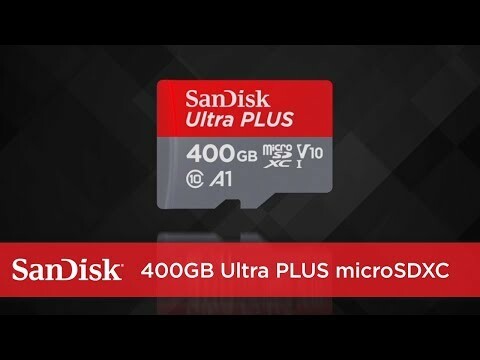 Rated A1, the SanDisk Ultra® PLUS microSD™ card is optimized for apps, delivering faster app launch and performance that provides a better smartphone experience. UHS Speed Class U1, Video Speed Class V10 and Speed Class 10 allow you to shoot Full HD video and high-quality photos. Available from the Google Play™ store, the SanDisk Memory Zone app5 lets you view, access, and back up your phone's files in one location. It can also automatically move files from your device to your memory card to free up space. The SanDisk Memory Zone app offers an easy way to organize, browse, and back up files on your AndroidTM powered mobile device. 30 years in Germany, Canada and regions not recognizing lifetime warranty, visit our warranty and user guide page for more information. ** Up to 100MB/s read speed; write speed lower. Based on internal testing; performance may be lower depending on host device, interface, usage conditions and other factors. 1MB=1,000,000 bytes. 7 Approximations; results and Full HD (1920x1080) video support may vary based on host device, file attributes and other factors.